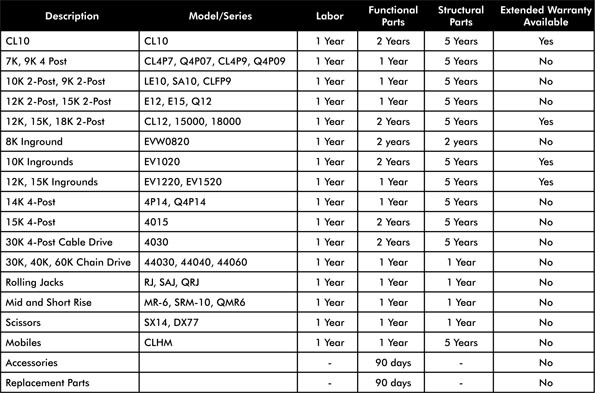 Challenger’s 15000 2-post lift can expand your fleet service capability to heavier vehicles such as trucks and medium-duty commercial vehicles. Featuring low-profile 2-stage front and 2-stage rear arms, the 15000 offers symmetric lifting capability. A single-point air actuated lock release system that disengages column locks simultaneously. Stack adapters come standard. 2’ column extensions are available for added versatility. We also offer the 15000 in a cargo van model designed to service high cube vans. The 15000-3S offers a low-profile adapter. The 15000 two post car lift features low profile arms, oversized steel pulleys, 60" lifting carriage, padded overhead cut-off bar, adapter accessories, and truck lift models with column height extensions for higher profile vehicles. No other car lift company gives you more. Drop-in style stack adapters help reach pickup points on vehicles with running boards or side steps. Simply take out the screw pad, drop in the stack adapter extension and replace screw pad to reach lifting points. Stack Adapter Extension Kit includes four 3" Stack Extensions, two 6" Stack Extensions & two Organizer Racks with hardware. Organizer racks mount to automotive lift column to keep adapters within reach. Works with all Challenger two post automotive lifts. 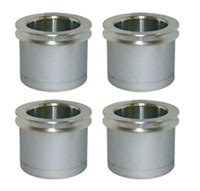 Set of 4 frame engaging truck adapters for 10,000, 12,000, 15,000 and 18,000 two post automotive lifts. 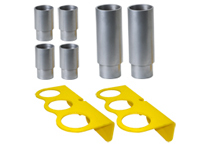 Frame engaging adapters are ideal for lifting vehicles such as pickup trucks with frames. They provide direct contact to frames without the slipping associated when lifting on slippery, sprayed undercoatings with traditional rubber pads. Cradle provides secure fit to frame in tight spaces. Works with all Challenger above ground two post lifts. 15,000 & 18,000 two post automotive lifts require reducer busing kit part #10317.